Gareth Shaw made a great start in Italy with a 65. Galgorm Castle professional Gareth Shaw was delighted to finish with six birdies in his last 10 holes to lie just a shot off the lead in the weather-delayed Montecchia Golf Open in Italy. Back on the Challenge Tour after topping the Alps Tour money list last term, the Lurgan native fired a six under 65 to share second place behind red-hot Frenchman Charles-Edouard Russo. Shaw shares second spot with Danes Lucas Bjerregaard and Mark Haastrup, while Newcastle resident Simon Thornton was also six under with three holes to play when play was suspended. Rathmore’s Alan Dunbar was tied for 41st after a two under 69. Russo said he took inspiration from his best friend François Calmels’ victory last week to shoot a seven under par 64 before thunderstorms interrupted play. All but five of the afternoon groups will have to return on Friday morning to complete round one, but Frenchman Russo was safely in the clubhouse with a one-shot lead after carding eight birdies and one bogey earlier in the day at Golf Club della Montecchia near Venice. Russo, playing on a sponsor’s invitation in the €160,000 event, said: “François is like a brother to me and it was fantastic to see him win the Challenge de Madrid last week. We’ve been friends since we were in the same class at school as ten year olds and now we live very close to each other. “It has inspired me, although I’ve been playing very well for the last month and a half now. I came third in the French National PGA Championship, which helped me get an invite here. “Another rough day, hitting it great and cannot seem to heat up with the putter, need some work to make the weekend,” Murphy tweeted. 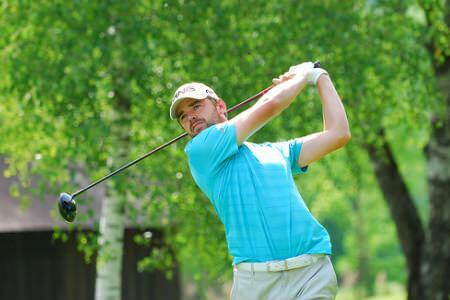 Gareth Shaw showed some encouraging form after a slow spell when he opened with a bogey free 67 in the Kärnten Golf Open presented by Mazda. Gareth Shaw in action in 2012. Gareth Shaw’s biggest regret from last season is that he topped the Alps Tour money list without winning an event. But after adding a 68 to his opening 65 to lie a shot behind clubhouse leader Jamie Moul, the Lurgan native is hoping he can capture the Challenge Tour’s Montecchia Golf Open presented by POLAROID. 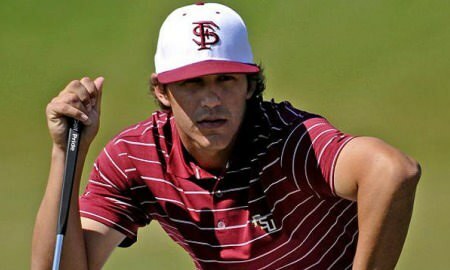 Brooks Koepka took a big step towards his second Challenge Tour victory with a third round 62 in the Montecchia Golf Open presented by POLAROID Picture courtesy Florida State Athletics. Gareth Shaw’s first taste of life in the final group of a Challenge Tour event ended in disappointment but there was better news as Alan Dunbar made his first cut as a tour professional. 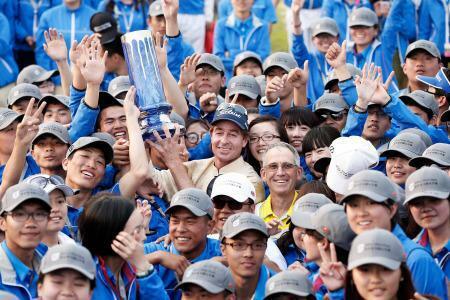 Wonderful Getty Images picture of champion Brett Rumford (and his caddie) with the Volvo China Open volunteers. American Brooks Koepka won €25,600 as he romped to his second Challenge Tour title with a seven-shot victory in the Montecchia Golf Open presented by POLAROID. But Rathmore’s Alan Dunbar can also be pretty pleased with his first tour cheque for the modest sum of €544 given the way he battled to make the cut in the weather-delayed second round on Saturday morning. Gareth Shaw’s third round 65 has left put in the mix at Royal Waterloo. Gareth Shaw will be hoping his recent experience will stand after a sensational tird round 65 left him just a shot off the pace heading into the final round of the Telenet Trophy at Royal Waterloo in Belgium.